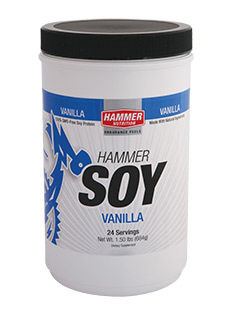 Hammer Soy’s highly concentrated formulation provides you a whopping 23 -25 grams of high quality protein per serving (25 grams for Unflavored; 23 grams for Vanilla), making it easy for you to meet your daily protein requirement. Unlike many other soy protein supplements, Hammer Soy contains only naturally derived soy protein and absolutely no GMO (genetically modified organism) soy protein. Genetically altered foods pose potential health threats, including the introduction of new or more potent allergens and toxins, and reduced nutritional content. To protect your health and maximize your benefits, Hammer Soy has not, and will not, contain any GMO-derived soy protein. Vanilla Flavor. 24 Servings.